M & M Stockyards , will make an appearance at this year’s Agquip in Gunnedah. Visitors will be able to get the low down on all the latest gear from these cattle yard experts. 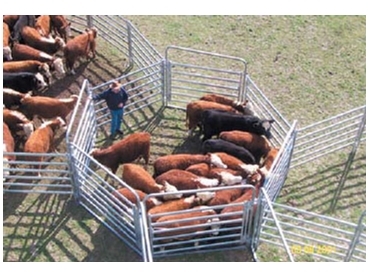 M & M has been manufacturing quality custom-designed cattle yards since 1990. This well established family business was started by father and son, Frank and Shane McNamara. Since Frank’s retirement in 2002, Shane and Judy have continued expanding the business. They now operate from their premises in Manilla, NSW and continue to support the people on the land. At their new premises, they have three full cattle yards on display, as well their range of portable panels, cattle crushes, calf cradles and loading ramps. M & M look forward to Agquip. The organisation plans to make the most of this opportunity to show their wares to the crowds during this popular event.